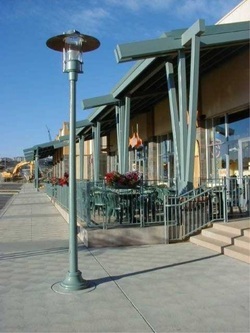 Whatley Fiberglass street lighting poles. 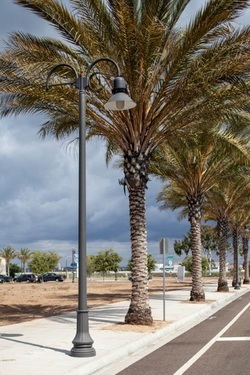 As the leading sustainable provider of architectural grade fiberglass light poles and composite lamp posts, we are utilizing materials and processes that minimize our impact on the environment in our cutting edge facility. Composite production consumes up to 50-60% less energy than steel, aluminum or concrete production. Hazardous air pollutants have been reduced by 95%, while improving production efficiency. Hazardous wastes have been lowered by 90%. switched to premium cost and quality styrene free resin in 2010 to remove carcinogens from our manufactured products. Smooth, tapered composite shaft constructed of continuous fiberglass filament using the patented Whatley winding technology. ST Poles are engineered to provide an exceptional strength to weight ratio. 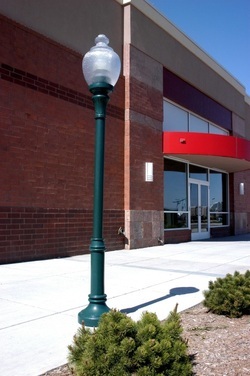 These lamp posts are capable of supporting single and multiple luminaire applications. 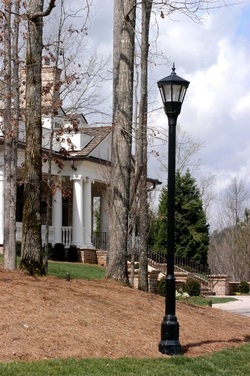 RF4 Fluted residential Fiberglass Pole with D15 base and 1010 Fixture. 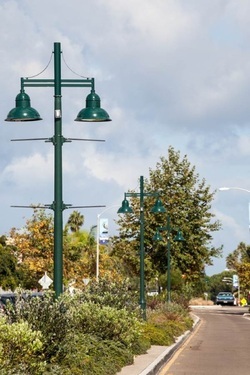 Residential developments typically can take advantage of Whatley’s perfect direct embedment solutions which save money in the installation that can be reinvested above grade to enhance the styling of the outdoor lighting poles and fixtures. 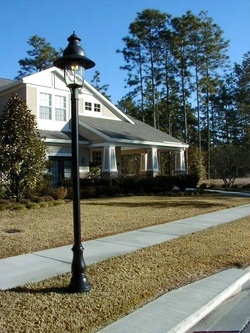 Whatley provides lasting charm to residential communities with our durable lamp posts and fiberglass light poles and offer a wide range of styling to satisfy any budget. 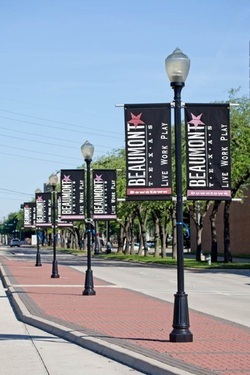 And of course residential areas are places where families live and play and our non-conductive fiberglass and composite poles offer some peace of mind against possible leakage of electrical current. 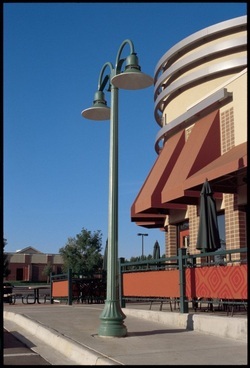 RF4 Fluted Fiberglass pole with a D4S base and 1002 light fixture. 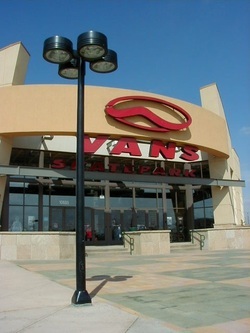 commercial projects at a more affordable price. shaft with optimum performance, making this series the perfect choice for small scale residential, municipal and commercial projects at a more affordable price. RS4 Pultruded Composite shaft with D21S base and 1002 fixture. Smooth or textured, tapered composite shaft constructed of continuous fiberglass filament using the patented Whatley winding technology. RT Poles are engineered to provide an exceptional strength to weight ratio. Fluted, tapered XTreme posts are composed of a wound fiberglass core surrounded by BASF formulated elastomeric urethane armor. 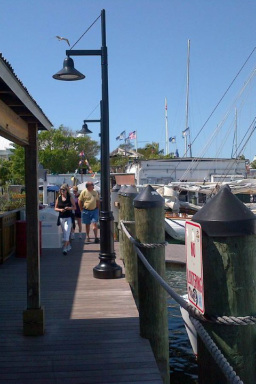 Nothing beats spending time by the water and people flock to waterfront venues. Everything from upscale retail, boardwalks, to functional docks grace waterfront locations and they all need lighting for safety and ambience. 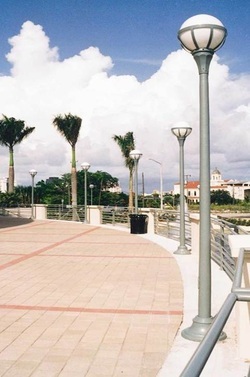 However these locations are highly corrosive environments due to the abusive nature of salt, sand, and humidity, our corrosion resistive composite Whatley poles are perfectly suited to thrive under these conditions and have the added peace of mind of being nonconductive which is especially desirable near water. Smooth, tapered Xtreme posts are composed of a wound fiberglass core surrounded by BASF formulated elastomeric urethane armor. Available in 4.5" top OD.